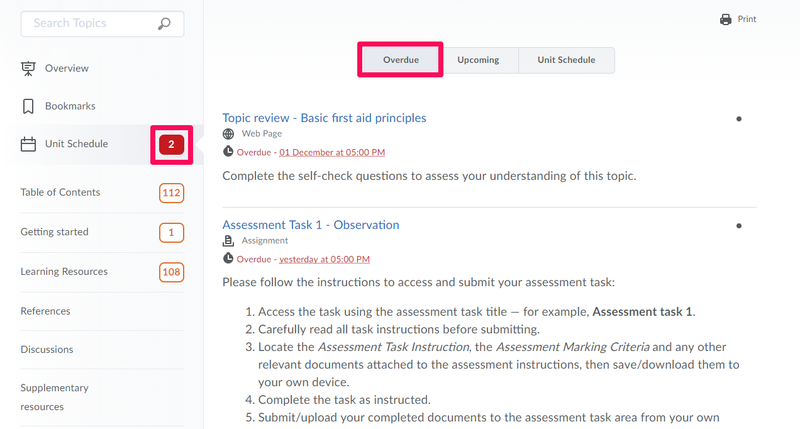 Use the Content tool to access unit materials, complete required activities, and monitor your completion progress on topics contained within each unit module. 1) When you access a unit's Content tool for the first time, the first page you land on is the Overview, which educators will use to post your Unit Study guide and introductory material. If your educator has left the Overview blank you will not see it listed and you will land on the Table of Contents. 3) The Unit Schedule page lists unit material due dates, start dates, end dates, overdue unit activities, and all events within the unit from the Calendar tool for the next seven days. The number of overdue items in the unit appears in red. Unit events are also listed in the Calendar tool. 4) The Table of Contents panel lists all modules available in your unit. 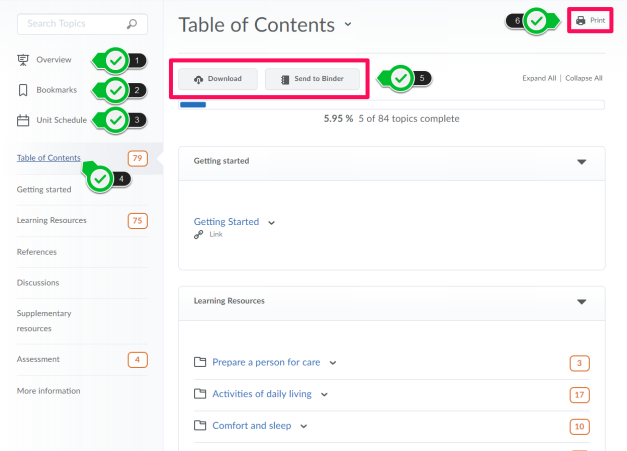 If numbers appear beside each module name in the Table of Contents panel it indicates that topics are being tracked for completion, and that you have a number of topics you have not accessed. 5) The unit content options located on the Table of Contents page allow you to download your unit content in zip file format or send it to your Brightspace Binder account to review offline. 6) Print your unit outline, or navigate to a module's landing page to print a module's outline. Note: the print function may not be available for all file types. Click on a document topic. Click Print or click Download and print from your computer. View a list of all overdue content topics within a unit in the Overdue tab in the Unit Schedule area. The topics on this list are sorted from most to least overdue. You can click the topic to immediately access and complete the topic. Only topics with a set due date but no end date or an end date later than the due date appear on this list since you must have time remaining after the due date to access and complete the topic. The Overdue tab only appears if you have content topics that are not complete by the set deadline. The number of overdue topics in the Overdue tab appears in red beside Unit Schedule in the Content menu. When you access an overdue topic, it disappears from the list in the Overdue tab. When you complete all overdue topics, the Overdue tab disappears from the Unit Schedule area.